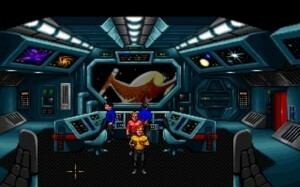 To commemorate the anniversary of Star Trek’s first appearance on television (I’ll let you guess which anniversary), Interplay created a series of classic adventure stories packaged in this game. It should be noted that the DOS version shares little with the NES version, and less with the Game Boy version, so you can expect unique challenges and gameplay in each one, should you desire to play them all. It should also be noted that a far superior “CD-enhanced” version was released a year after the floppies, and that is the one we will be visiting today. Interplay was no stranger to the adventure genre, previously developing both Neuromancer and the Bard’s Tales games. 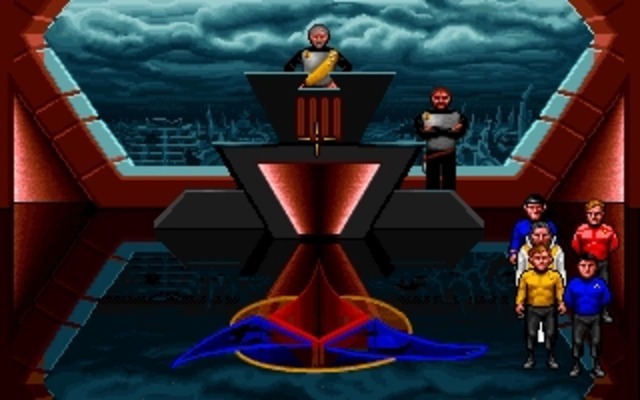 25th, though, represents their first attempt at a Sierra or LucasArts-style point n’ click adventure. To their credit, they do a pretty good job. 25th is played out through seven “episodes,” each containing a brief ship sequence and an extended “away team” section with Kirk, Spock, Bones, and a hapless redshirt. The ship sections offer some setup for the plot and occasional arcade dogfights with enemy ships. The real focus of the game is in the ground missions, with adventuring worthy of any of Sierra’s Quests, and a classic Star Trek vibe. Each episode will begin with a title sequence and some form of setup, almost always in the form of an Admiral sending you orders to investigate the X system where Y is happening. You’ll then click on Chekov, and pick the correct location out of an unlabelled star chart. The chart is correctly laid out in the manual, of course, which acts as this game’s copy-protection. Warping to the incorrect system generally leads to an ambush, and the destruction of the ship. These ship sequences are always seen from the same view of the bridge. 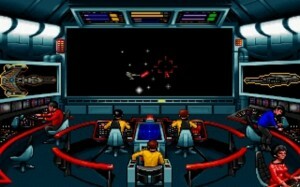 You default to controlling the ship itself, with the mouse dictating pitch and yaw, and the number keys handling speed. 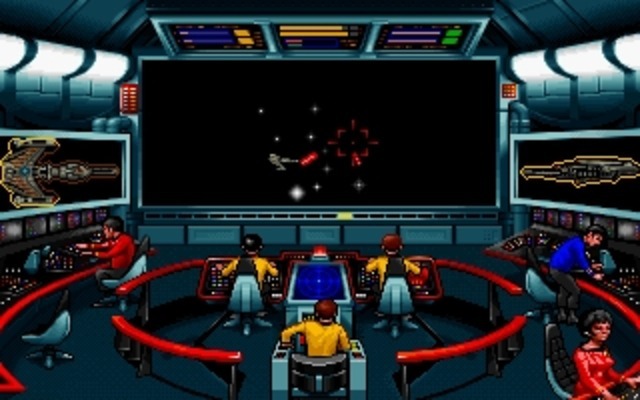 By pressing Tab, your ship locks to the current course and your mouse now controls a generic cursor to click on the various members of the bridge crew. Their uses are quite limited, though fine for the purposes of advancing the story. Uhura can hail another ship or planet, you can ask Spock for advice, Scotty can allocate damage repair priority, and Sulu can enter into orbit around a planet. Should you enter into hostile territory, hotkeys can immediately raise the shields and arm the weapons. The game then becomes an awful lot like Wing Commander, with a ship that can’t turn as well as the fighters in that game. When in combat, you have a radar display in the middle of the bridge, and tabbing back to ship control now also aims a set of crosshairs at your foe. The left mouse shoots phasers and the right fires torpedoes, with varying lead distances required for each. Setting the crosshairs to the edges of the screen moves the ship in that direction. The A key will switch the side tactical displays between views of the damage to your own ship, and the damage to your last-hit enemy. There is a noticeable pause between the switch, however, and knowing how damaged your enemy is turns out to rarely be helpful. You cannot intentionally target components of an enemy ship, and though you will be able to see which side has the weakest shields, you won’t be able to maneuver the sluggish Enterprise around with the precision required to take advantage of this information. The best tactic then becomes to track an enemy to the best of your ability and unload into it with your weapons before moving on to the next target. Space combat works well enough, though it’s certainly not a star feature of the game. Unfortunately, it will be an unavoidable part, especially with the inclusion of a race of pirates called the Elasi. These pirates have been created for this game with the pretty-much-exclusive intent of giving you a reason to fight frequently. Later in the game, they will upgrade their ships to fire three photon torpedoes at a time, giving you a reason to die frequently. Still, every mission will not call upon your skills in inter-ship battle, and there are a few that mostly just send you directly to the away team section. Either way, once you have a clear sector and an orbit around whatever planet you are to inspect, you click on Kirk’s transporter icon and head down and see what trouble you can ameliorate, or stir up yourself. Every away team mission will consist of the same crew members, and the same standard kit. You’ll get medical and science tricorders, two flavors of personal phasers (stun and full), and a communicator for keeping in contact with the Enterprise. 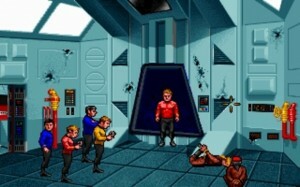 In a neat touch, McCoy, Spock, and the redshirt can be used like items themselves, and doing so is often the correct solution for a puzzle. McCoy is obviously handy for treating the injured, and Spock is a master of all things scientific, technical, computative, or in needing of a neck pinch. The redshirt, in keeping with the show, can be satisfyingly ordered to his doom. Interaction follows the Sierra style. Right-clicking brings up a command menu in the shape of a human figure, and clicking on various areas select different interface options. To look at an item, you click the figure’s eyes to change to the “Look” cursor, then click on whatever you want to look at. To change to “talk” you click on the figure’s mouth, and then the character to talk to. This usually works without problems, though it frequently leads to not knowing precisely how the game wants you to interact to continue – a problem I thought would disappear with the end of the text parser. “Examining” an object with Look, the science tricorder, Spock, McCoy, and Use, will almost always give different outcomes and unique perspectives. But at the end of the day, it’s five different versions of the “Look” command. This results in going back to the “try everything” approach common to adventure games and never quite fun, or in progressing through every scene in layers – Looking at everything first, then using the science tricorder on everything, then Spock, and so on. The cursor itself can also be the source of some enormous hassles. The interaction icons highlight in red when they are over something you can manipulate, which is helpful. However, there are areas where the icon stays lit, despite passing over three individual action zones. For example, clicking on a control panel may tell you that it handles the weapons systems, but clicking on a button on the control panel will actually fire the weapons. If you’re not aware of this level of distinction, you may end up clicking repeatedly on that panel for its described function, instead of the specific button on it, and not understanding why you can’t proceed. 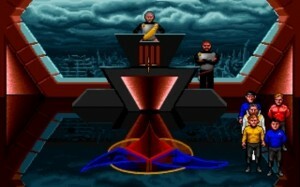 Your actions affect your final score for that mission, as in Sierra games, but you will never see your score during the course of that mission, or a breakdown at any point. That means you won’t know what you did (or didn’t) do to give yourself points. If you’re not used to Sierra adventures, then this probably won’t matter – it’s perfectly possible to complete a mission without concern for score, and the score itself is only a means for replayablility. However, if you insist on getting a 100% on everything (which will affect your ending dialogue), then you’ll need to be prepared to play through many more times than you’re used to for games like this, and keep track of your different actions and dialogue responses on your own. The game is not going to be particularly forthcoming with its answers. To its credit, I never encountered anything too abstract. However, presumably to be more sci-fi, there’s equal amounts of science in with the fiction. One mission in particular has you working in a laboratory to culture a cure for a virus. After you consult the computers, and have Spock and McCoy explain the purpose of all the equipment, you still have to figure out how to operate it, and you still need to know some basic chemistry. If you don’t know that dihydrogen monoxide is water, and don’t know how to make it from the description contained in that name, you’re in trouble. I still don’t know what polyberylcarbonate is, but I only know it was needed in the cure and took a long time to figure out how to get it. There’s also another mission where you must do Base 10 to Base 3 conversions, based on a clue recieved by researching the planet’s culture in the ship’s computer (a nice touch). Though the computer has all the entries you’ll need, including some helpful ones for the conversion math, you’ll be stuck if you didn’t do, or know you had to do, all this research before you went down to the planet. It’s VERY important to note that the game does not automatically save between missions. Choosing “restart mission” or closing the game and opening it back up, will always start you at the beginning of the game’s first mission. Though areas where you can get stuck are few, the ones that do exist are unforgiving, and multiple saves become the only thing that will prevent you from starting over completely. At the very least, it is worth making a new save for the beginning of each mission, so you can start from the beginning of that mission instead of the beginning of the entire game. The CD version doesn’t do anything to enhance the graphics, but it would have been hard to beat the look of the floppy version anyway. The locations are colorful without being ostentatious, and mimic the look of the 60’s sets faithfully. The artists also do not attempt any revisionist history by bringing any part of the films’ look into the game – everything here is pure TOS. You will not see any closeups of any of the major characters, but the faces that do appear on viewscreens and the like are perfectly suitable. The ship sequences are the only thing that look even slightly goofy, with starships apparently made up of a couple different angles of stock ship photographs or model shots. It results in ships that blur when you get close, and seem to “skip” as you rotate around them, but all par for the course for space sims of the time. The enhanced CD brings the show’s cast back to completely voice all their characters, along with a female narrator for all the observations and descriptions. The system works perfectly, with a completely-playable option to remove all text subtitling from the game. Text will then only appear on dialogue choices and non-verbal cues that can’t be covered by the animation (like Spock raising an eyebrow). Should you be helped by the text (in particular, the library computer is a text parser, and the subtitles helped me with the exact spelling a few times) then you have the option of turning them on as in the floppy version, while still retaining the cast voice-overs. The CD also brings in classic and spot-on versions of the effects from the show – phasers, tricorders, the click-click-click of the communicator; all present and sounding great. I found the combination of authentic show effects, cast voices, and playable no-subtitle option to be a perfectly immersive recreation of the show – exactly what Interplay was surely going for. It’s worth noting that each of the stories is a completely new work that doesn’t rehash or revisit any of the original shows. A classic character will return for a cameo, but in an all-new scenario. There are also two pretty prominent references to Wrath of Khan (a hijacked Federation ship defeated by override codes and a run-in with Carol Marcus), but these are not retreads of the plot of that film. Still, the most important credit is that these are new stories, not written by original show writers, and still easily worthy of being episodes from the show themselves. They offer new challenges while still retaining the spirit of the series, and are quite fitting tributes for the show’s anniversary. If you’re not a fan of Trek, that won’t necessarily hamper your enjoyment of this game. When I first played the floppy version, I had seen only a scant few of the original series on reruns, but still had a great time. I’ll admit that I enjoyed the game more on my recent CD-version playthrough, having now seen some of the show’s DVD volumes. True fans will probably pick up on smaller references I may have missed, or get even more out of playing inside their favorite show. The CD version will also give you a significantly extended final mission, as well as a few puzzle improvements over the floppy version, making it far and away the one to buy. 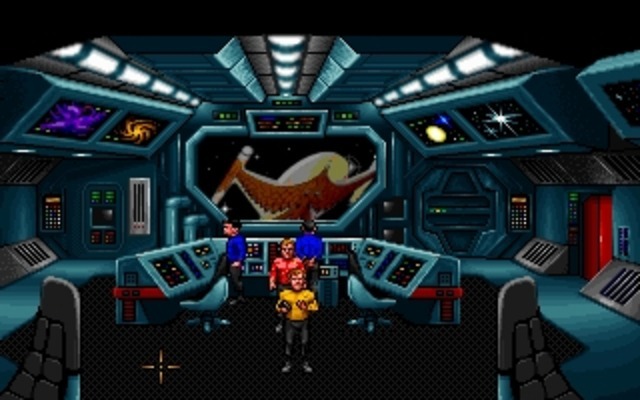 Though the game trips up a little when you have to struggle to find the correct “tool” to get the information you need, or the right hotspot to make progress, it’s mostly an enjoyable experience, and a perfect recreation of classic Trek as an adventure game. CD version brings together cast, effects, and great orignal writing for seven highly enjoyable interactive episodes. Sometimes hard to know what the designers expect you to do, and too easy to overlook important hotspots. Frequent, smart saving is also required.